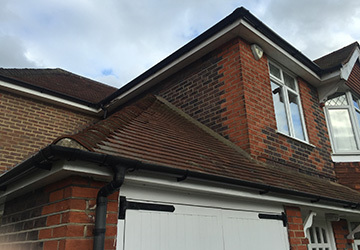 At A P Benson Roofing & Building, we have spent nearly forty years providing our Godalming customers with the finest quality soffits and fascias, flat roof repairs, chimney repairs, and other roofing services. 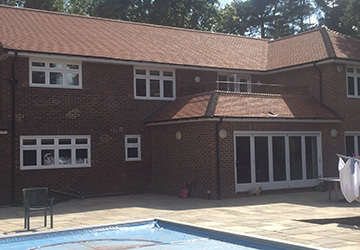 Our reputation for excellence is the equal of any roofing companies that service the Godalming area. Here you can find a small sample of the work we do. From roof cleaning and maintenance, to roof repairs and complete installation of a new roof system, A P Benson Roofing & Building is the only place our Godalming clients need to call for all their roofing requirements. Much of our work in and around Godalming involves roof repairs, and we are proud of our reputation as being among the best roofing companies in the area when it comes to high-quality roof repair work. 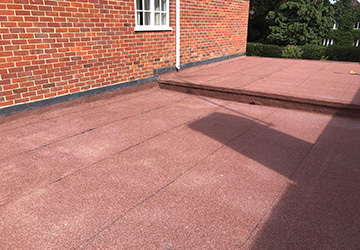 Flat roofs are a fast and economical solution in certain circumstances, such as roofing for garages and extensions, though they are not without their own complications. We are as skilled with flat roof repairs as we are with their pitched counterparts, so you can be sure of a job well done. From storm damage to repointing, our team of professional roofers will make light work of your chimney repairs, guaranteeing a neat join and tight seal to the rest of the roof. Acting as a support to the eaves and gutters, soffits and fascias are essential to the structural integrity of your roof. With decades of experience installing, repairing and replacing soffits and fascias, you can rest easy knowing that your roofline is in good hands. It’s not just pitched and flat roof repairs, soffits and fascias, and chimney repairs that we deal with. We also cover new roof installations, guttering repairs, moss removal, lead work, flashing, house and chimney re-pointing, building work including garden walls and patios and Velux roof windows replaced and fitted. We are based in Guildford and operate across most of Surrey. This includes our valued domestic customers and commercial clients in Woking, Chobham, Farnham and, of course, Godalming. We have been trading in Godalming since 1980, providing our customers in the area with a standard of roof repairs that other roofing companies are unable to match. Our team of fully-accredited roofers bring over 100 years of experience with them to every job, ensuring a professional service combined with a high quality finish. 01483 760 444 for your free, no-obligation quote.